Fresh figs? Check. Caramelized onions? Check. Pizza dough? Check. Honey? Check. 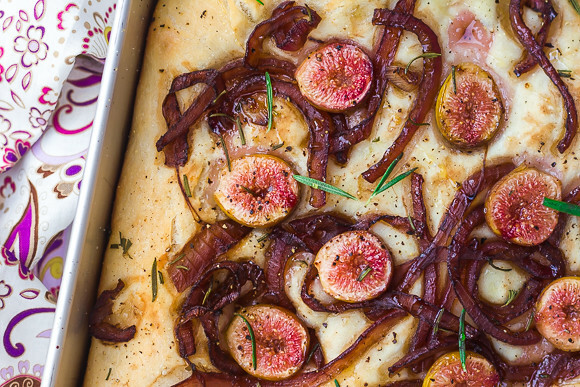 Those ingredients come together to make a fantastic focaccia for dinner. And then when you realize just how delicious dinner is, you turn around and make it again the very next day to take it to a pizza party. Because 1) good food was meant to be shared and 2) you probably shouldn’t be left alone with the leftovers. And by “you,” we all know that I mean I shouldn’t be left alone with the leftovers. This was by far the best backyard fig season we’ve ever had. 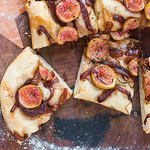 If you’re looking for fig recipe ideas, check out the Fig ingredient tag and stay tuned. Over the next couple of weeks, I’ll share recipes for all the ways we depleted pound after pound (after pound after 5 more pounds). 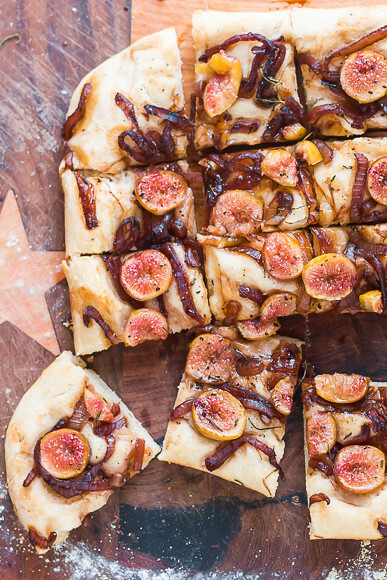 Fresh figs, balsamic-caramelized onions, and goat cheese top this chewy focaccia. Generously oil the bottom and sides of a 9x13 baking pan. If your pizza dough is refrigerated, pull it out and let it come to room temp while cooking the onions. Add 1 Tbsp olive oil to a saute pan and cook the red onions over medium-high heat until they begin to brown. Add 1/4 cup water, reduce heat to medium, and continue to cook until the water has evaporated and the onions begin to caramelize. Add balsamic vinegar and cook until the vinegar has completely reduced - there should be no standing liquid left in the pan - and remove from heat. Gently stretch the pizza dough into a rectangle and then press into the pan, stretching and pushing the dough to the ends of the pan. 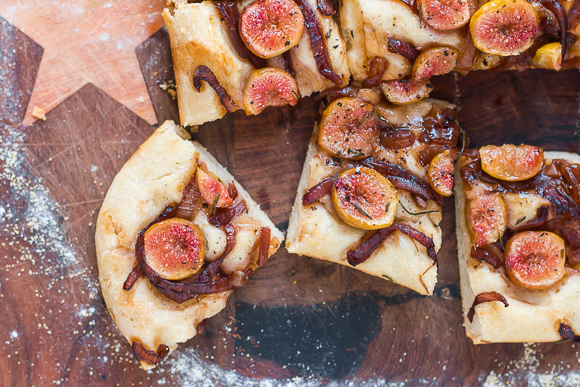 Brush the dough with olive oil and spread the caramelized onions over top. Add the fig halves, a pinch of salt, several grinds of black pepper, and the chopped rosemary. Bake for 20-25 minutes until the crust is puffed and golden brown. Remove from oven, drizzle lightly with honey, even more lightly with balsamic, and crumble the goat cheese over top. Transfer to a cutting board (I used two spatulas and lifted it from the ends, up and out of the pan) and cut into 8 or more servings. Best warm or at room temperature the day of baking; store leftovers covered in the fridge and reheat for maximum enjoyment. Your “not-recipes” that involve figs are better than so many more involved recipes WITHOUT figs…so I say keep ’em coming!